Labor Day weekend is upon us once again, and to help you close out the summer, this SUNDAY [8/31] we’ve got another installment of Sound Liberation Front‘s popular bites-meets-beats backyard party RUB-A-GRUB at DO OR DINE in Bed-Stuy featuring yours truly, DJ LIl TIGER, alongside heavyweights DJ STILL LIFE (STR8 West Coastin/Worldwide Smash) and DJ AKALEPSE (Truth & Soul/Plane Jane). Along with the feel-good DJ party vibes, there will be drink specials and a unique food menu curated by Do or Dine’s gifted culinary genius and Food Network star Justin Warner. 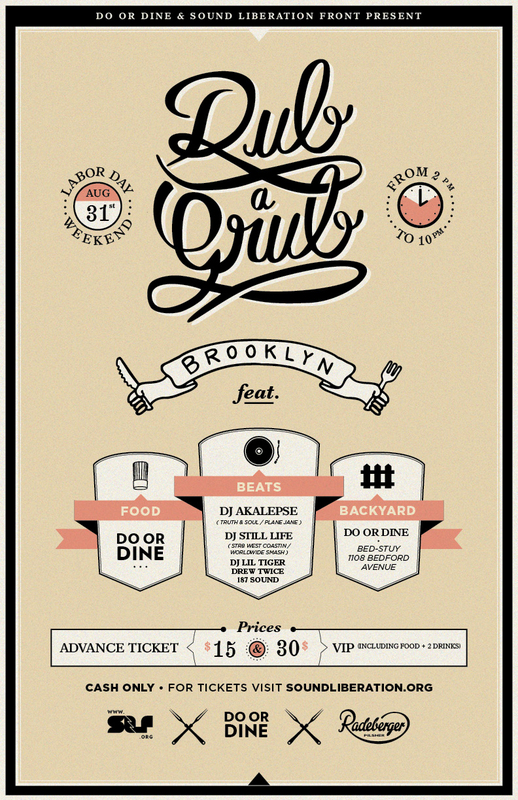 Do or Dine and Sound Liberation Front are teaming up again for RUB-A-GRUB, a food and music backyard party featuring DJ Akalepse (Truth & Soul/ Plane Jane) and DJ Still Life (STR8 West Coastin/ Worldwide Smash) and a three part menu crafted by Do or Dine‘s chefs. The event will kick-off in the afternoon and feature three rounds of food and drinks, each coupled with different DJ sets. There will be drink specials and a unique food menu by Do or Dine’s chef, Justin Warner. Obsessive crate digger DJ Akalepse is known for running the full spectrum of soul music. Together with Rich Medina, he hosts the widely respected weekly NYC party PROPS. Before that he was Resident DJ at the legendary and now closed NY Venue APT. Coming up as a Battle DJ, Lepse learned early the importance of moving the crowd. His humility and endless respect for music has garnered him accolades in soul, funk and hip hop circles the world over. With a heavyweight stash of 20,000+ records he plays classic tunes right next to obscurities, always pushing the listening audience a little in a sincere effort to break new records and reintroduce slept on tunes simultaneously. Akalepse has also put his vinyl passion into his role as label manager/ A&R of Brooklyn-based Truth & Soul Records, famous for releasing hot wax from artists like El Michel’s Affair or Lee Fields. DJ Still Life is a member of a dwindling tribe: DJs who learned the craft on turntables and vinyl, and were raised on dubbed mix cassettes in the rapid fire cut-and-paste tradition of the Bronx forefathers. Whether spinning golden era hip-hop, brand new electronic productions, vintage rarities, or club essentials, Still Life puts a premium on presentation and inventive mixing. His current regular gigs include a throwback boogaloo party Jackpot! 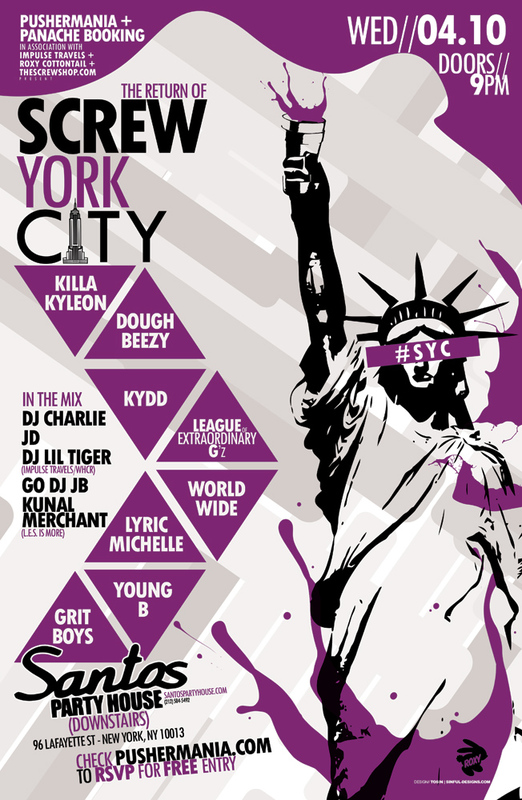 with DJ Small Change, and a summertime West Coast hip-hop daytime BBQ. 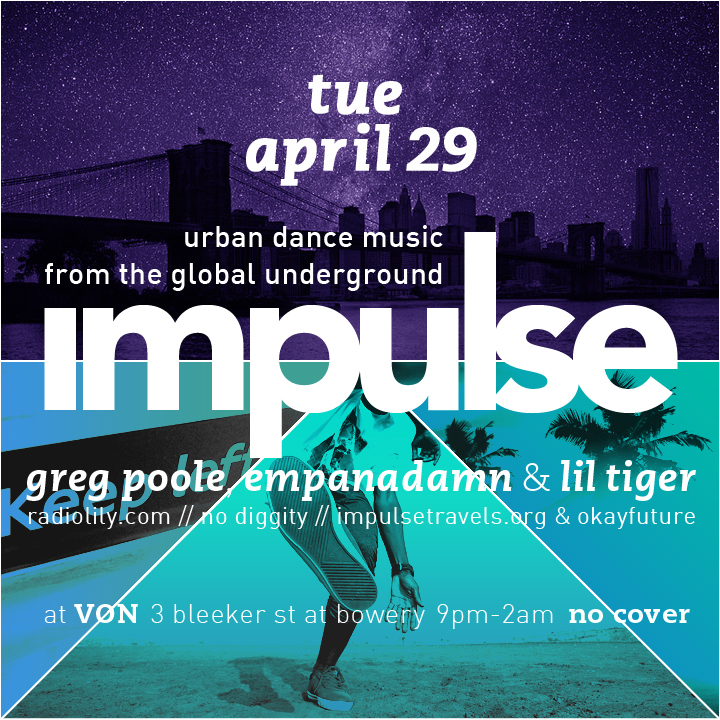 Caribbean-born, Houston-raised, Queens-based DJ Lil Tiger cultivates his soulful sound from a blend of r&b, funk, disco, house, broken beat, soca, dancehall, afro-latin rhythms, future bass and hip-hop. He’s the founder and co-host of IMPULSE TRAVELS and a contributing writer to Okayplayer’s OKAYFUTURE. Co-host of IMPULSE TRAVELS and founder of NYC’s popular NO DIGGITY party. Veteran downtown NYC DJ Greg Poole is known for his wide repertoire and eclectic sets. Also know as a champion of UK underground music, Greg has spent much of the past decade in London spinning house, garage, grime and more. He can currently be heard on RADIO LILY every Saturday spinning his mix of classic, new and eccentric versions of reggae. 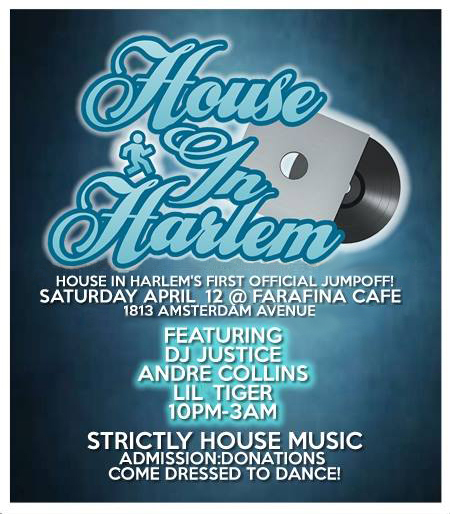 This SATURDAY [4/12] at Farafina Café and Lounge in Harlem, we’ll be joining the House in Harlem crew for a house music party to raise money for our beloved WHCR, the non-commercial, listener-supported radio station where I host my weekly IMPULSE TRAVELS show. I’ll be throwing down some deep and soulful house tunes all night alongside WHCR’s ANDRÉ COLLINS (Universal Love of House Music) and DJ JUSTICE (The Flavor Zone). Admission is pay what you wish, with all proceeds going to the radio station. No donation is too big or too small. As a non-profit station with very diverse, community-based programming, we need all the financial help we can get. * Pay what you wish. All proceeds go to WHCR. 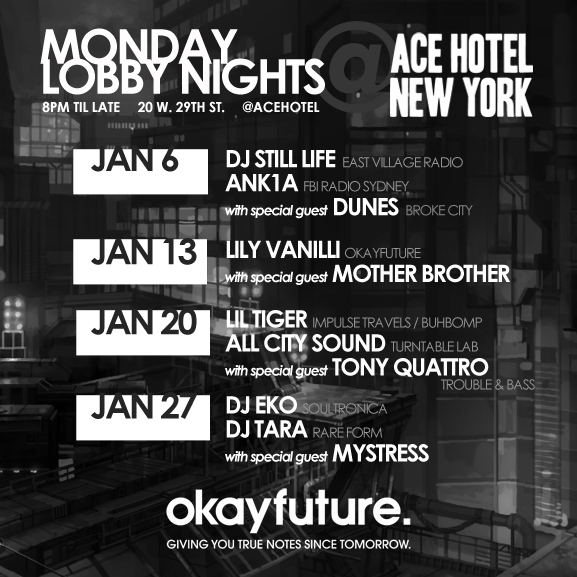 Come celebrate the last gasp of MLK weekend listening to soulful, future-forward electronic music in the lobby of the Ace Hotel with the team from Okayfuture, including yours truly, DJ Lil Tiger alongside All City Sound and special guest — producer/DJ extraordinaire Tony Quattro. We’ll be showcasing the forward-moving, creative, and fresh sounds that we’ve been championing on the blog. It’s FREE and we won’t keep you out late, since we know you’ve begrudgingly gotta go back to work the next day. (The party goes from 8pm-midnight). Come have a cocktail with us and enjoy the sound of the future. 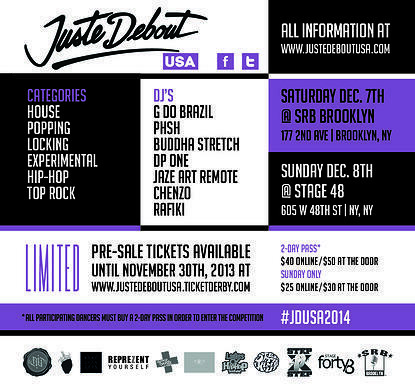 Juste Debout‘s U.S. finals are back in NY this week, which means poppers, lockers, house and hip-hop dancers, and boogie bodies in general will invade the city to flex their best dancefloor skills for a chance to rep the U.S. in Paris at the world finals next year. 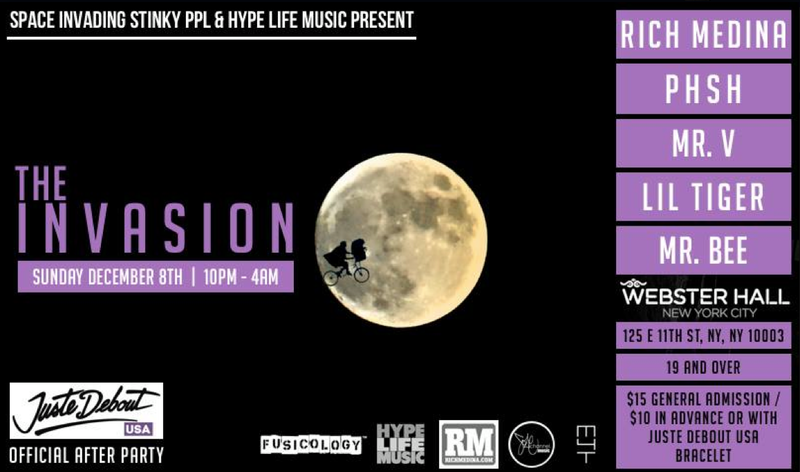 And as a bonus, the good folks at Space Invading Stinky PPL and Hype Life Music are throwing a massive after-party at The Marlin Room in Webster Hall featuring an incredible lineup of DJs and some of the best Hip-Hop, House, Funk, Classics and more to keep you moving deep into the night. Headlining the bill is world-renowned DJ and tastemaker RICH MEDINA, the legendary founder of Jump N’ Funk, Lil Ricky’s Rib Shack. He’ll be joined by one of Philly’s finest, Red Bull 3style East Coast Champion and Illvibe Collective heavyweight DJ PHSH. Also on the decks will be one of my favorite house music artists, Sole Channel Music label head, MR. V.
Rounding out the lineup will be yours truly, DJ LIL TIGER, host of WHCR 90.3fm’s weekly Impulse Travels Radio Show, and France’s Detroit transplant, MR. BEE. This thing will get packed, and it’s gonna be all kinds of good. Hope to see you there. 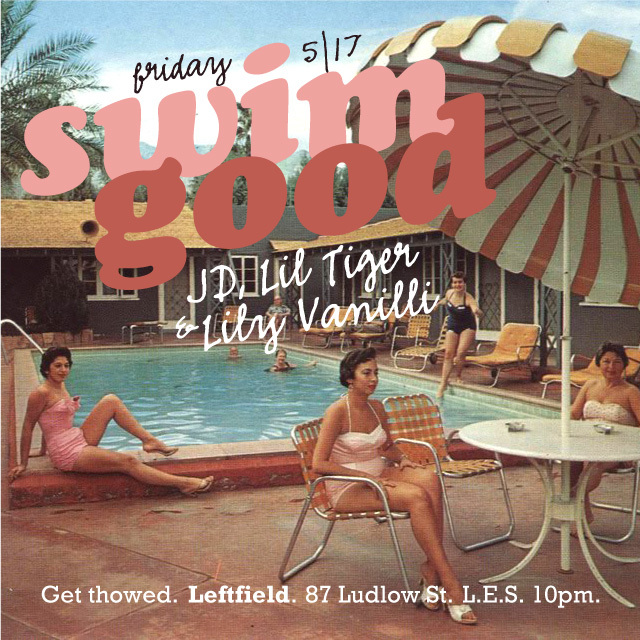 This week, DJ LIL TIGER and JD will be the featured guests at SMELLSMORE and EMPANADAMN’s NO DIGGITY party in the East Village. 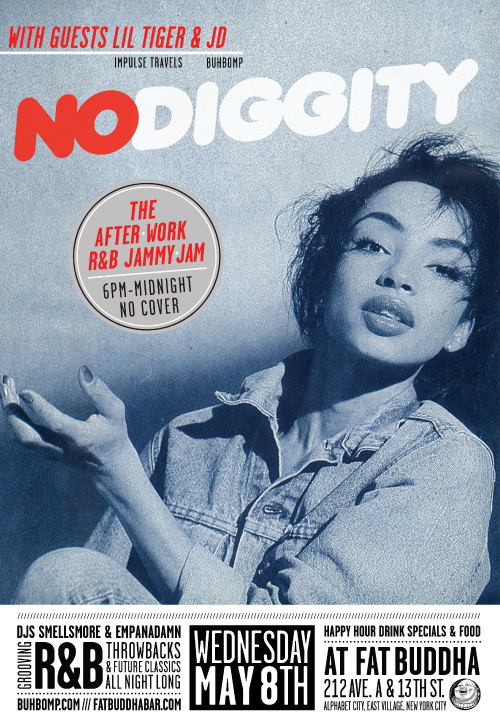 As always at NO DIGGITY, expect a range of old gems and future favorites—soul classics, disco, slow jamz, hip-hop remixes, new jack swing, lovers rock, house, neo soul, Atlanta Bass, pop … whatever goes—all wrapped into one seamless groove. Happy Hour runs through 10pm and food will be available until late, so come thirsty and hungry! 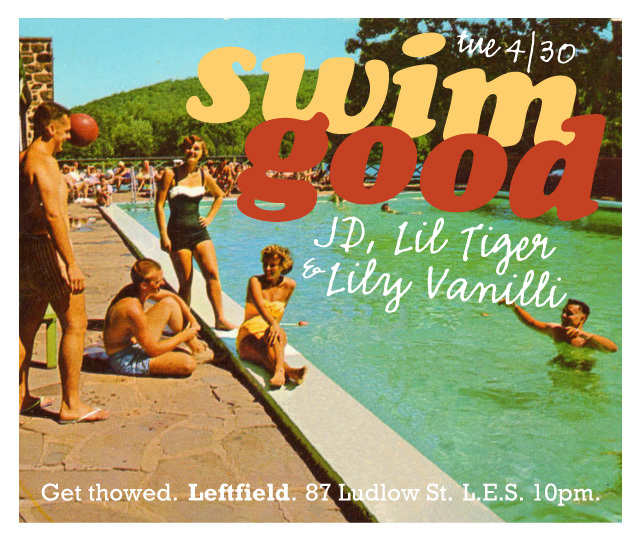 After a long, winter-y hiatus, we decided it was finally time to bring back SWIM GOOD, last year’s smash summer monthly party celebrating our country rap roots. Texas transplants JD, LIL TIGER + LILY VANILLI are ready to get you turnt up on some southern rap, New Orleans bounce, reggae and more. We’re kicking things off this TUESDAY, APRIL 30, and we’re bringing the party to Manhattan to a spot called LEFTFIELD, a new bar off of Delancey and Ludlow in the still-respectable part of the Lower East Side. 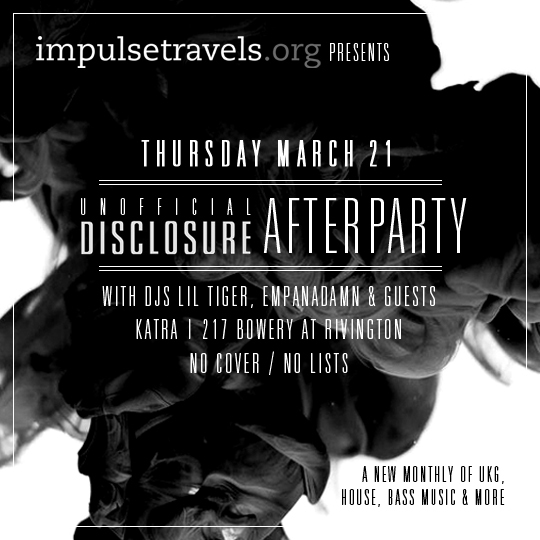 BuhbOmp’s own EMPANADAMN and DJ LIL TIGER (host of WHCR 90.3fm’s Impulse Travels Radio Show) are teaming up at Katra to throw a little after party shindig coinciding with British phenom production duo Disclosure’s sold out show at the Bowery Ballroom on Thursday. We’ll be blasting some choice house, disco, bass, UKG, UK Funky tunes and more, right around the corner from the Disclosure show. Admission is FREE all night. Come get down with us. Disclosure ‘White Noise’ from Luke Monaghan on Vimeo. And you can read up more about them dudes here.